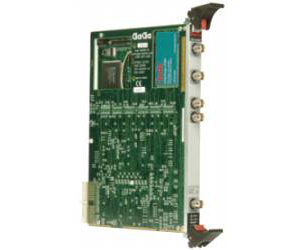 CompuScope 14100C is a 6U form factor CompactPCI card that can sample analog signals at speeds up to 100 MS/s with 14 bit resolution and store the data in the on-board memory. CompuScope 14100C uses two monolithic sub-ranging A/D converters, each running at 50 MS/s, to provide a dual-channel simultaneous sampling rate of 50 MS/s. In the single-channel mode the two ADCs are clocked in a ping-pong mode to achieve up to 100 MS/s sampling. An on-board crystal-controlled timing circuit ensures timebase accuracy and long-term thermal stability. Applications Include: DSL Testing, 3G, High Quality Imaging, Disk Drive Testing, RADAR & RF Receivers.